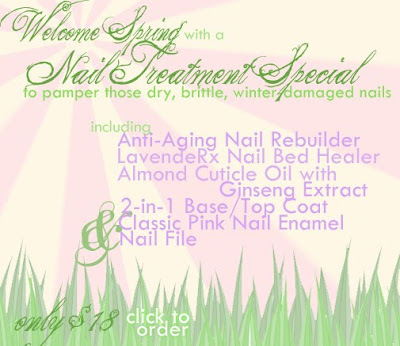 I wanted to share news of a nail treatment special at Diamond Cosmetics. It's important to take extra care of nails going into the Spring season. The damage that occurs in cold and dry weather begins growing out as Spring approaches. There can be greater weakness at the nail line and corners are especially vulnerable to breaks and tears. Quality treatment products can help. For the past few weeks, I have been using the Almond Cuticle Oil with Ginseng extract and it's been really nourishing for my nails and cuticles. I'll be posting a full review soon. This special offer is available at diamondcosmetics.com for US residents.